Latest Senate Health Bill Would Cut Funds To Blue States : Shots - Health News The bill's sponsors say their plan to reallocate federal health funding among states is more equitable. It also would cause largely Democratic states to lose funding while Republican states gain. Two other reports, by consulting firm Manatt and by the left-leaning Center on Budget and Policy Priorities, show the same pattern. And a fourth analysis from the Kaiser Family Foundation released Thursday also largely concurs. The bill's sponsors say it's a matter of basic fairness. 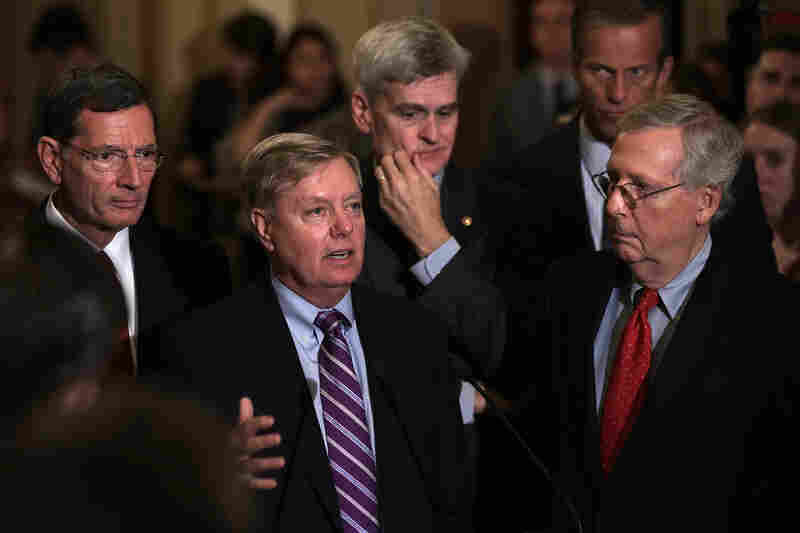 "Four states get 40 percent of the money under Obamacare: New York, California, Massachusetts and Maryland," Sen. Lindsey Graham, R-S.C., said on the Senate floor on Sept. 14. "Our goal is by 2026 to make sure every patient in every state gets the same contribution, roughly, from the federal government." Sen. Lindsey Graham, second from left, speaks as Sen. John Barrasso, from left, Sen. Bill Cassidy, Sen. John Thune and Senate Majority Leader Sen. Mitch McConnell listen during a news briefing Tuesday. Graham, and his co-sponsor Bill Cassidy, R-La., both highlighted the inequity in the current system on the day after they introduced their bill. Neither mentioned that the states getting less money voluntarily shunned the Medicaid expansion that made millions more people eligible for coverage. The Graham-Cassidy bill would dismantle the major components of the Affordable Care Act, or Obamacare. It eliminates the federal health insurance exchange; gets rid of the individual mandate that requires people to buy insurance, along with the subsidies that help people pay for a policy; and ends the expansion of Medicaid. Then it takes all the money from those programs, puts it together and redistributes it to the states to set up their own health care systems. The formula laid out in the bill distributes the federal dollars based on the number of low-income people in a state and their overall health status. Massachusetts Gov. Charlie Baker, a Republican, says the formula ignores the fact that health care in more expensive in high-cost states, and sometimes in rural areas, than elsewhere. Baker points out that wages make up a big chunk of the cost of health care. "How you can say that there's one cost of health care per service delivered for the entire country and make that work?" Baker said on NPR's Morning Edition. "A high-wage state, of which Massachusetts is one, gets absolutely slammed under a proposal like that." The Avalere analysis shows Massachusetts losing about $8 billion in federal health care funding under the proposal. However, it's worth noting that several other states that would lose money are Republican – including Arizona, Nevada, Kentucky, Arkansas and Louisiana. Although Louisiana's Cassidy is co-sponsoring the bill, the state's governor has come out against it. And Arizona Republican Sen. John McCain's vote could end up being crucial.